Harry Pawter is 700th Adoption! 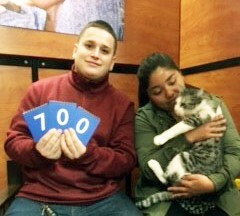 Los Angeles, CA — Harry Pawter, an enchanting Tabby cat, took a break from quidditch to meet his new family and become the 700th adoption at the PetSmart Charities™ Everyday Adoption Center by spcaLA (Society for the Prevention of Cruelty to Animals Los Angeles). Harry Pawter did not catch the golden snitch, but he did receive age appropriate vaccines; a neuter surgery; veterinary care; and a microchip before going to his new, loving home. Located inside PetSmart®, the Everyday Adoption Center opened in January 2015 and is operated and staffed by spcaLA. The pets available for adoption come from spcaLA shelters. This model is used successfully throughout the United States but this is the first and only PetSmart Charities™ Everyday Adoption Center in California. Visit the Everyday Adoption Center and meet your friend for life! Adoption hours are Monday through Saturday, 11am-9pm and Sundays 11am-6pm.